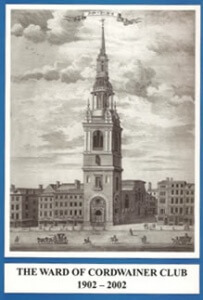 The Ward Clubs of the City of London were originally formed as Rate Payers Associations but have long since developed a new role. The Ward of Cordwainer Club was founded in 1902. Its centenary was marked with the publication of The Ward of Cordwainer Club 1902 – 2002, obtainable from the secretary, and the commissioning of the Cordwainer Statue. The objects of the Club are to promote and encourage interest in the affairs of the City, to generate a friendly spirit and improve the quality of life mainly within the Ward. It is also intended to give support to the Alderman, his Deputy and Common Councilmen in carrying out their considerable duties on behalf of the City of London and the Ward in particular. The Ward maintains a strong link with the Worshipful Company of Cordwainers, founded over 700 years ago, and which today plays a strong role in nurturing young talent in the fashion and shoemaking industries. The Club is managed by a Committee consisting of President, Vice President, Chairman, Vice Chairman, Honorary Secretary, Honorary Treasurer, the two immediate Past Chairmen, together with other elected members of the Club and Common Councilmen of the Ward. Former Presidents of the club include a number of Lord Mayors who have also served as Aldermen in the Ward – Sir Walter Vaughan Morgan, Sir Cuthbert Ackroyd, Sir Peter Venneck, Sir Brian Jenkins and Sir Roger Gifford. Other than the President, Vice President and the Common Councilmen, the Committee is elected on a rotation basis and the Officers are elected annually. The Club currently has 260 members. Membership is open to anyone with an interest in the Ward. Anyone interested in joining the club is invited to contact the Secretary or complete and return the application form. The annual membership subscription is for the first year £50, thereafter £25 . The Club organises various functions throughout the year for its members and their guests. Recent visits have included the Tower of London for the Ceremony of the Keys, Buckingham Palace, Guildhall Art Gallery and the Old Bailey. The Club also organises formal and informal luncheons to which members are welcome to bring guests. There is an annual ‘members only’ luncheon which provides an opportunity for members to meet each other and to welcome new members to the Club. The Club’s major event is The Annual Lunch which is held in December at one of the Livery Halls in the City of London, and the Club is usually honoured and privileged to have the Lord Mayor and one of the Sheriffs as its guests. Thirty members and their guests visited Lincoln’s Inn for a guided tour followed by a three-course dinner and wine in the Barristers’ Common Room. The 90 minute guided tour covered the gardens, the Old Hall, the Chapel and the Great Hall. In the gardens, members saw one of the few street gas lamps that are still in use. In the Chapel we saw the Coats of Arms granted to Past Treasurers of the Inn, including a recent one which had the Treasurer’s hobby of a sail board as the centre piece with the Treasurer’s dog balancing on the board. In the Great Hall we were informed of the history of the Inn and its present day role for students and practising barristers. We were amused by the report of the Inn’s Wine Committee resolving at the start of World War Two that, in the event of an invasion, members would drink the Inn’s stock of wine to prevent it falling into enemy hands. On 14 July, 23 Members met in the splendid Chief Commoner’s Parlour at The Guildhall for the Annual Members-only luncheon. This occasion provides an opportunity for members to meet the newly-elected Officers and Members of the committee. The Chairman expressed the Club’s gratitude to the Ward’s Alderman and Common Councilmen for making this special venue available. It was greatly admired. The Chairman also outlined the Club’s diary of events from September through to February and, in particular, the Annual Luncheon in the Vintners’ Hall on Friday, 9th December. At the invitation of Mr Timothy Duke, the Norroy and Ulster King of Arms, twenty members had a tour of the public rooms of the College of Arms, including the Earl Marshall’s Court, with Mr Duke explaining the history of heraldry and the present day role of the College. This was followed by a three-course dinner in the Cote Brasserie on Ludgate Hill. The numbers were restricted to 20 by the College to assist all to be able to view historical documents without undue delay. If there is sufficient demand, a further visit for unsuccessful applicants may be arranged in 2017. The Reverend Professor Peter Galloway, the Chaplain, welcomed twenty members and their guests. He went through the history and unique status of the Chapel. Members viewed the throne for the Monarch and the throne for the Master of the Royal Victorian Order, who is the Princess Royal, together with their respective banners. After receiving a description of the grants of arms of eminent members of the Order which were displayed on the panelling, members moved to the Robing Room. The Chaplain explained the displays of the five categories of the Royal Victorian Order and showed the Robe of Queen Elizabeth, the Queen Mother. Following the visit members enjoyed a dinner at the Waldorf Hilton Hotel in Aldwych. Some members then adjourned to the bar of the Savoy Hotel to sample the Cordwainer Cocktail on the bar’s list of City of London drinks !! The Club held its premier event, the Annual Luncheon, at the Vintners’ Hall. The guest of honour was The Right Honourable The Lord Mayor, Alderman Dr Andrew Parmley. He was accompanied by The Lady Mayoress, Wendy Parmley, Alderman and Sherriff William Russell and his wife, Hilary. The Guest Speaker was Richard Ashworth, a Member of the European Parliament. 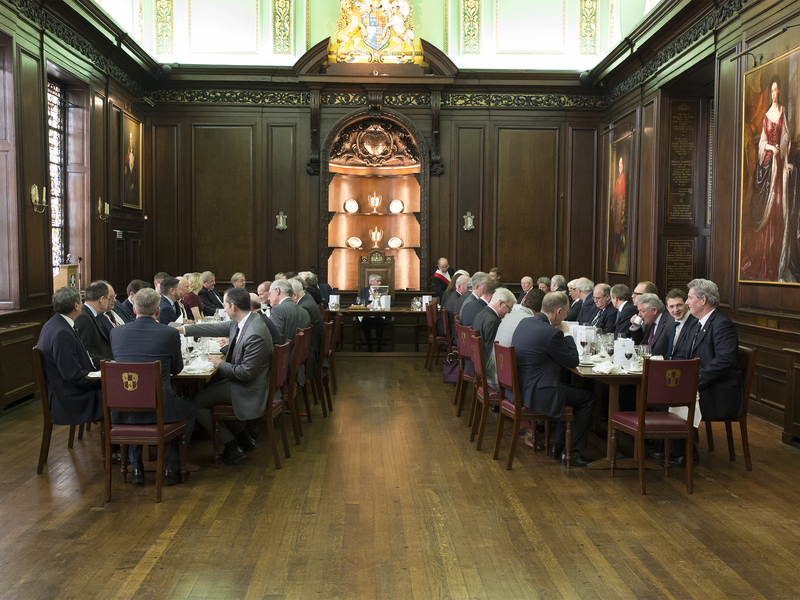 The historic Livery Company Hall was filled to capacity with 149 members and guests. The Civic Toast was proposed by the Chairman, who referred to the numerous duties undertaken by The Lord Mayor and the two Sheriffs during their year of office. He made special mention of Alderman and Sherriff Peter Estlin who was the Sherriff at the Central Criminal Court that day. The Chairman presented the Lord Mayor with a cheque from the Ward Club for the Lord Mayor’s Charities. The Lord Mayor responded and congratulated the Club on having held numerous activities during the year. He endorsed the Chairman’s remarks that the Ward is well served by its recently re-elected Alderman, Sir Roger Gifford, and the three Common Councilmen, Sir Michael Snyder, George Gillon and Mark Boleat. The President, Alderman Sir Roger Gifford, proposed the toast to the guests. The Masters from the Butchers, Cordwainers and Tin Plate Workers Livery Companies and the Latvian Ambassador to the UK were welcomed. Richard Ashworth responded with an informed view on how relations between the UK and other members of the European Union might develop during the negotiations to implement Brexit. He concluded by proposing a toast to the Club and its Chairman. The Chairman closed the proceedings by thanking members for supporting the event. He expressed special thanks to Tom Moore, the Club’s Secretary and the Secretary’s Secretary, Karen Pond, for their hard work in making sure everything ran smoothly. 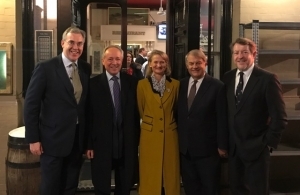 Thirty-four members and their guests enjoyed a private viewing of the museum which is housed in 48 Doughty Street, the house that Charles Dickens, his wife Mary and their first three children lived in from 1837 to 1839. The four-storey Georgian terrace house is furnished as it was when Dickens lived there. After a glass of wine, members were split into two groups each accompanied by a knowledgeable guide. We learned why forks and spoons on the dining room table were laid with the backs showing. This was to show the silver hall mark to impress dinner guests. Following the tour, members adjourned to the Luce e Limoni Restaurant in the Gray’s Inn Road for a three-course dinner with an excellent Italian wine. 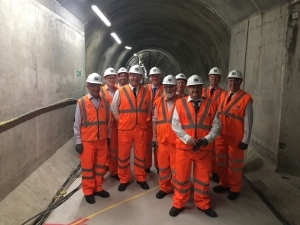 In June, an intrepid band of Cordwainers descended into the bowels of the earth to view the construction site of the Crossrail works at Liverpool Street Station and Moorgate Station. We walked along a platform that is a quarter of a kilometre long! Andrew Wolstenholme OBE, CEO of Crossrail, explained that at the time, the project was 83% complete and on budget. Over 700 apprentices have been recruited for the project and train testing is due to commence at the end of 2017. We enjoyed a dinner afterwards at The Botanist in Broadgate. In September, the Club visited the premises of John Lobb in St James’s. Founded in 1866 by John Lobb, we met the fifth family owner, William Lobb, still maintaining the craft. The business has two Royal Warrants and has enjoyed many famous clients after being popularised by Edward, Prince of Wales (later Edward VII). In the St James shop, individual lasts are made for clients – the shoes are made by 25 craftsmen located globally. The basement is a labyrinth of shelves stuffed with pairs of lasts! In indication of the quality (and price) is that black shoe polish costs over £50. Dinner was held at the Dukes Hotel. In October, the Hon Sec Tom Moore and Sir Michael Snyder organised a trip to Freemasons Hall in Great Queen Street. This was followed by dinner at Tuttons. On 21 November the Lady Mayoress, Samantha Bowman, in her first official engagement switched on the Christmas lights in Bow Lane and Watling Street. Mrs Bowman was accompanied by the newly elected Lord Mayor, Alderman Charles Bowman, and the two sheriffs, Alderman Tim Hailes and Neil Redcliffe. Following the switching on the official party visited a number of shops and bars in Bow Lane and Well Court, and members of the Ward Club enjoyed refreshments in Ye Olde Watling. The proceeding were enhanced by carol singers from the City of London Academy Islington. Cordwainer’s elected members, Alex Barr, Sir Michael Snyder, Sir Mark Boleat and Sir Roger Gifford with the Lady Mayoress, Samantha Bowman. In December, the chairman welcomed the Lord Mayor and Lady Mayoress to the Old Library in the Guildhall. The guest speaker was Jane Platt, a non-executive director of the FCA and formerly CEO of National Savings. She spoke about the dawn of premium bonds and the cutting edge technology which was pioneered by the technologists formerly at Bletchley park and creators of Colossus. She compared this to bitcoin, which is concerning regulators and may be transient, and the technology underlying it, blockchain, which will endure. Ward Club Chairman, Jon Norton, present a cheque to the Lord Mayor, Charles Bowman, for his charities. The Ward Club’s Annual General Meeting was held at the Tallow Chandlers’ Hall on 21 March 2018. David Tucker was elected Chairman and Michael Bunn Vice Chairman for the coming year. David is the Chief Executive Officer of Worldwide Currencies, and Michael is a chartered accountant. Dominic Turner joins the committee and John Miller was appointed Assisted Honorary Secretary. The accounts show the Club to be in a healthy position, and membership increased during the year by six to 222. 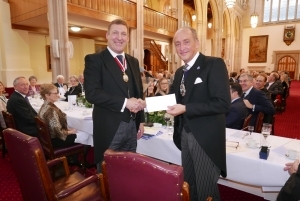 The outgoing Chairman Jon Norton reported that highlights for him were visits to the London Metropolitan Archives and Freemasons’ Hall, being a guest at a Worshipful Company of Cordwainers dinner and the Club’s participation in the City Beerfest. Following the AGM the owner of Saracens Rugby Club, Nigel Wray, was the guest speaker. He spoke about the philosophy behind the Club, which has a family atmosphere, and also the work of the Saracens Foundation, which supports education and employability, inclusion, participation and health and wellbeing. The new Chairman, David Tucker, outlined his programme for the year. This includes a talk on Sir John Smith (whose statue is in Bow Churchyard), a tour of the new Bloomberg building, a presentation on the “Saracens Way” and the usual events at the Lord Mayor’s Show and the switching on of the Bow Lane lights. The Chairman announced that the former head of the London Stock Exchange, Xavier Rolet, would be the guest speaker at the annual lunch in December.